For many of us, pets are our most precious asset so it makes sense that we would dedicate a day to keeping them safe during one of the scariest things we can imagine. National Pet Fire Safety Day takes place every year on July 15, and it’s a day to learn how to keep your pet safe in a fire. It was started by the Kennel Club and ADT Security in 2009 to help pet owners learn safety measures to protect their beloved pets and homes from fire, and it’s a great opportunity to learn how to keep your fur baby safe. On July 15, get a free Pet Fire Safety Window Cling at your local volunteer firehouse. First responders will see this and know to look out for any pets inside. Use #PetFireSafetyDay to post on social media and raise awareness to friends and family about the day and ways that they can keep their pets safe from fires. For families with kids, this tradition is even more important. Discuss your family evacuation plan, designate someone to carry out the pets and execute a fire drill on this day every year. 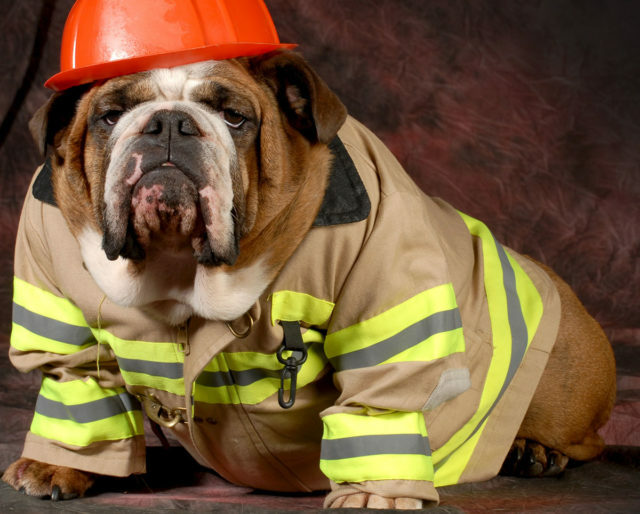 There are many ways to keep your pet from causing fire. Blow out candles before leaving home, block off access to kitchen or remove stove knobs if pets can reach it, and keep any and all wires out of chewing distance, especially from kittens and puppies! Discuss with your family who will be in charge of rescuing your pet in the event of a fire. Planning and practicing fire drills will help the family remain calm and help ensure that your pets are not forgotten during a chaotic evacuation. As part of your evacuation plan, include a list of your pet’s hiding places, so that firefighters will know where to look in case your pets don’t make it out with you. Also, make sure your pets have collars with up to date tags attached in case they escape on their own.